Continental developed a more Hammond like tone than other 1960's organs. The drawbars on the Continental organ are used for voicing and tone control and are based on the operation of a pipe organ. 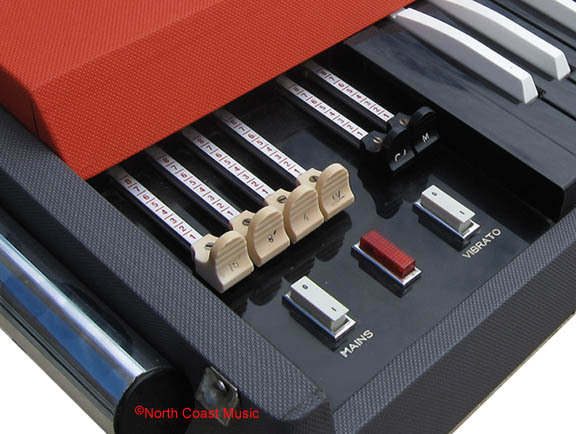 The Vox Continental drawbar system borrowed heavily from Hammond. On the Continental, the left four drawbars are labeled 16', 8', 4' and IV. As on a Hammond organ, these voicing drawbars act as volume controls for the electronically simulated pipe organ lengths they control. 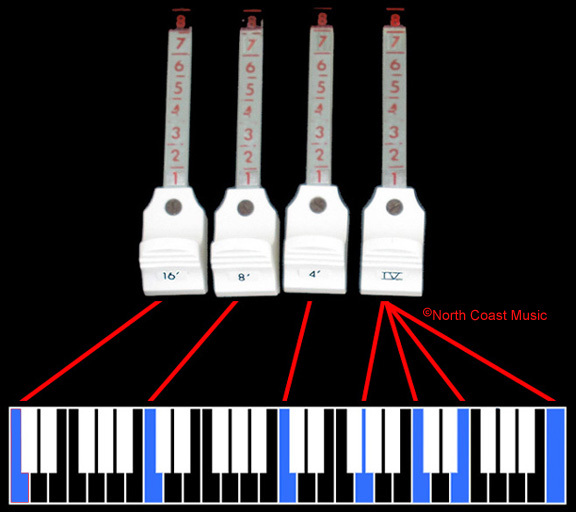 The Vox Continental drawbars are connected to the output of the serial dividers on the tone generator cards through the key contacts. The sixth divider on the tone generator cards produce the lowest tones on the organ (click here for an explanation of the divider operation on the V301E tone generator cards) . The output of the sixth, ot lowest divider on the tone generator card is roughly equivalent to the tone produced by a 16' pipe on a traditional pipe organ. In the lowest octave of the organ, the 16' drawbar is connected to the output of the sixth divider, adjusting its volume. The drawbar may be pulled out to make the tone louder and pushed in to make the tone softer. Again, in the lowest octave, the fifth divider on the tone generator card feeds the 8' drawbar, making a tone equivalent to an 8' pipe on a pipe organ and produces a tone one octave higher than the sixth divider. The same applies to the fourth divider and the 4' drawbar, which produces a tone two octaves higher than the sixth divider. The drawbar labeled "IV" is called "the fourth rank." The fourth rank is a combination of four tones, again based on the length of the pipes on a pipe organ that would produce these tones. The tones are based on the 2 2/3' , 2', 1 3/5', and 1' pipes. These are considered to be "overtones," and make the tone of the Continental more complex when compared to the Vox Jaguar organ, which does not offer this tonal option. The choice of these four overtones (2 2/3' , 2', 1 3/5', and 1') for the Continental was obviously influenced by the circuits of a Hammond organ, which offered these same four semitones on four individual drawbars. The two black drawbars adjust the tone of the organ. On the UK and US made versions of the Continental, these tone drawbars were dark red. The left or "~" drawbar offers flute voicing. The symbol on this drawbar, "~" represents a sine wave, the visual representation of a flute tone on an oscilloscope. The right, or "M" drawbar offers the reed voicing, a much brighter tone. The "M" symbol on the drawbar is the visual representation of a reed tone on an oscilloscope. These tone drawbars may be used individually or in combination with each other. Like the white drawbars, these also act as a volume control. When pushed all the way in, the organ will make no sound, regardless of the position of the white drawbars. You might wish to purchase the Vox V301 schematic to help you repair the drawbar circuits. Parts values for all capacitors, resistors, and diodes are included in this schematic. Click here to purchase this from North Coast Music.